The local library has a kids program, and there are seasonal art projects. 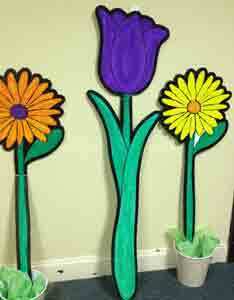 For Spring/Summer, they painted flowers on cardboard or cardstock with tempura paints. Each flower is about the height of a 5th grader. I never see this library without kids being involved, or teenagers writing papers on the public computer for school, or providing outreach to people who are job searching or doing family history searches. (Go awesome librarians and library!) I get so much joy out of walking over there to browse the books, and find out the latest technological thing that I can do (download “books on tape” to an iPhone, iPod, or another similar device). Note I said “books on tape”… heh. I do find myself reading lots of things I wouldn’t normally have bought from Amaz*n or a bookstore. And I do love audio books for when I’m driving. I have a huge Ken Follett book that I can’t wait to stick in the CD player on Monday, once my Irish mystery is done (Faithful Place, by Tana French – grim, dark, yet interesting, mostly because the voice on the audiobook beguiled me into liking a police procedural with lots of messy family details and shifting loyalties). So, any other books I should look for on CD to keep my commute interesting, or me knitting along? Anyone else have a fabulous little library?